Savvy CIOs know a company can no longer “bolt on” mobile capabilities. To truly succeed, an organization must put mobile first. 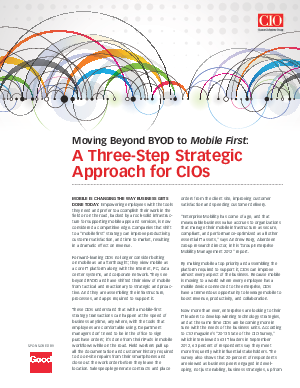 Check out this new guide from Good Technology—Moving Beyond BYOD to Mobile First: A Three-Step Strategic Approach for CIOs—to learn how including mobile as part of your core IT strategy improves productivity, customer satisfaction, and revenue. You’ll get the latest data to support a mobile first strategy, the must-have components to focus on in your mobile platform, and three necessary steps to becoming a mobile-first organization.